We are involved in providing a varied series of Automatic Shrink Sleeve Label Applicator For Neck Sleck. Our products are made under the management of dexterous experts in compliance with universal industry principles. 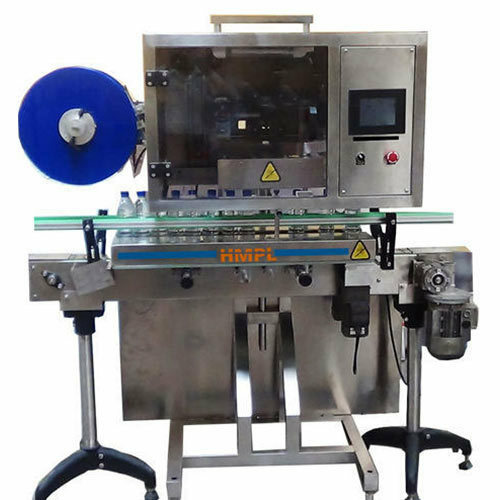 The Automatic Shrink Sleeve Label Applicator System consists of main structure, product transmission belt with guide adjustment, in-feed screw, sleeve former (mandrel), rotary cutter to cut sleeve, Safety acrylic cover, shrink tunnel with cooling fan, motors, sensors, electrical panel, AC drive, PLC HMI. Net Weight 550 Kg Approx. Dimensions 3050 mm (L)x 1200mm (W)x 2000mm(H) Approx. Established in 1999, Harikrushna Machinetech Private Limited is engaged in manufacturing and exporting of Bottle Washing Machine, Filling Machinery, etc.